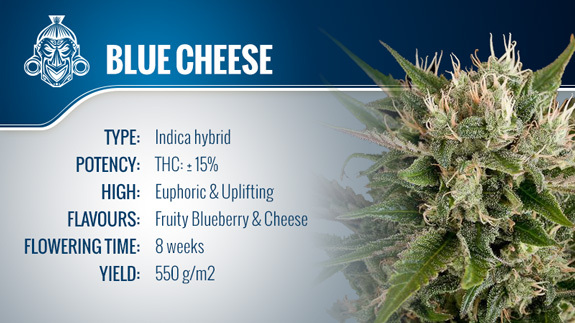 The original Blue Cheese was based on the genetics of two well-established and famed cannabis varieties - Blueberry, a fruity beauty from the 1970's and Cheese, a special Skunk phenotype with a very distinct smell. The father of the original Blue Cheese was the famous Blueberry, a strain that was born in the late 1970’s. Blueberry came to life when DJ Short, a breeder from the West Coast of the United States mingled the genetics of "Juicy Fruit," a Thai Sativa, a Purple Thai out of Oregon, Ohio, which was a cross between a Highland Oaxaca Gold and Chocolate Thai, and an Afghani male. The mother of Blue Cheese is the most famous cannabis strain that ever originated from the UK, Cheese, a special Skunk phenotype with a very unique reek. During the 1980's and early 1990's, DJ Short continued to perfect this strain. Later, DJ Short supplied Dutch Passion with seeds and in 2000 Blue Cheese won the 1st prize at the "High Times Cup" and in 2001 the 3rd prize at the "High Times Cup." The name of this strain perfectly describes what you can expect from this plant - you will be able to witness a beautiful change of the plant's color to blueish and purple hues as it gets colder and both the aroma and the taste of the buds is sweet, fruity and berry-like, with a noticeable musky undertone typical of the original Cheese. The high induced by Blue Cheese is that of a smooth and easy sensation with great euphoric and even psychedelic touches. You'll definitely feel happy before coming down nice and easy. To date, there are various versions of Blue Cheese available, but all are somewhat of a variation of the original. Blue Cheese by Dinafemis the perfect choice for growers with a lack of patience and those who live in a region with a short summer. This powerful indica dominant plant rushes through its flowering period within only 50 days. The buds are very resinous and studded with an abundance of pistils. It is highly recommended to send her into flowering at a maximum height of 40cm because she easily triples in height during the flowering time. The maturing plants exude a strong aroma of sweet and fruity berries, underlaid with a smell of vintage cheese. The smoke of the end product has an intensely sweet and fruity taste, followed by an aftertaste of cheese. Outdoors you should be aware that the intense smell and the height of up to 3 meters do not make for a discreet grow. You will really need a secluded and undisclosed spot or very tolerant neighbors if you opt for an outdoor cultivation. Blue Cheese by Royal Queen Seedshas been bred by crossing Cheese and Blueberry and then back-crossing the resulting strain with Cheese to stabilize the strain and to optimize the flavor. In an indoor grow you can expect plants that reach a height of 80-140cm after 60-65 days of flowering. Outdoors, the plants become slightly taller and are ready for delivering the goods by the end of September. After a few weeks into flowering the plants exude a sweet, earthy, musky and fruity aroma - and it gets more and more intense as the plants approach maturity, so make sure your ventilation system and carbon filters are ready to roll. This strain performs well in any growing setup, but the best results are achieved with the SOG method. A harvest of 500-600g/m² is pretty much the minimum, wherein the more experienced grower will be able to yield well in excess of that amount, especially when growing in a hydroponic system. Blue Cheese by Big Buddha Seeds is the yummy crossing of a Big Buddha Cheese and a Blueberry. This indica dominant variety grows up to a compact bush and develops an amazing central flower cluster within 8-10 weeks of flowering. This smoke has a very nice flavor that unites the taste of the original Cheese with a tasty dash of fruit and offers an uplifting, active and euphoric high. Despite being mostly indica, Big Buddha Seeds' Blue Cheese ranked on 3rd place in the "Best Sativa" category at the High Times Cannabis Cup in 2006. As you can see, the different versions vary a bit, but all carry the genetics of Blueberry and Cheese - since the original is no longer available it is hard to tell which comes closest to the strain DJ Short created in the late 1970's, so the choice is up to you to judge and decide which really lives up to the name Blue Cheese.